Perhaps one of the biggest surprises of the Marvel film franchise was ease in which 2011's 'Thor' settled into the universe. Kenneth Branagh crafted a film that vividly brought the grandiose nature of Thor's homeland of Asgard to the big screen, while also cultivating a necessary undercurrent of humour to match the idea of a demi-god simply turning up in modern day America. Branagh may not have returned for this sequel but Alan Taylor carries on his good work. 'Thor: The Dark World' follows a year after the events of 'The Avengers', which sees a newly matured Thor (Chris Hemsworth) forced to take on an enemy race led by the vengeful Malekith (an unrecognisable Christopher Eccleston), who wish to plunge the Nine Realms into darkness. Thor's beau Jane Foster (Natalie Portman) is the key to success for Malekith, having been infected by a mysterious force (on the titular "dark world") that he seeks to harness. Despite the title placing Thor front and centre, Loki (Tom Hiddleston) is again at this Marvel film's heart - at his most vulnerable and pathetic yet equally his most cunning and arguably courageous. Indeed, Thor himself seems to be less of interest in this sequel, as he is given little to do outside of his heroic action scenes. Similarly, Thor's minions (for lack of a better word) aren't showered in character development although pleasingly Heimdall (Idris Elba) is given a more expanded role. On Earth, Kat Dennings and Stellan Skarsgard return as part of Foster's scientific team - Dennings offers much of the film's irreverent humour, although she eventually starts to grate, while Skarsgard is hilariously unhinged. In addition, two amusing cameos also appear toward the end of the film, one of which being especially delightful. These strands of humour complement the serious action, which is largely and perhaps surprisingly engrossing, particularly the mid-film invasion led by Malekith. With so much CGI on offer, 'Thor: The Dark World' actually suits 3D, although is certainly not a necessity to the experience. Asgard again looks absolutely magnificent, while the film's finale takes place a lot closer to home as yet another recent blockbuster lays siege to London. This final set piece is the weakest element of the film, and not just because of a highly inaccurate joke about the London Underground. Nonetheless, 'Thor: The Dark World' remains a worthy successor, particularly thanks to a couple of moments of emotional gravitas. Be sure to stick around for the mid-credits scene. 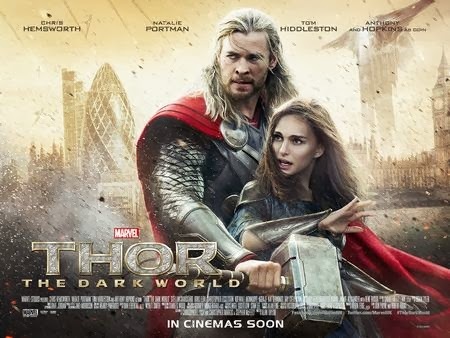 'Thor: The Dark World' is out in UK cinemas today through Walt Disney Pictures.